Turning word problems into meaningful, natural experiences is one way of describing what Dan Meyer was showing us at last night's (Aug 25) Math 2.0 Elluminate session. He's developing prototypes for curriculum units that he is beta testing with the help of lots of enthusiastic teachers who are willing to go the extra mile to do something similar. 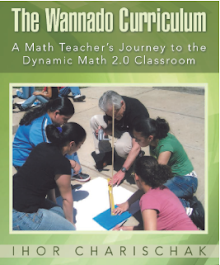 What Dan's cadre of early adopters (many of whom attended the session last night) are doing is testing the waters for a new kind of curriculum called WCYDWT (what can you do with this) which asks teachers to be creative designers of learning experiences for their students. 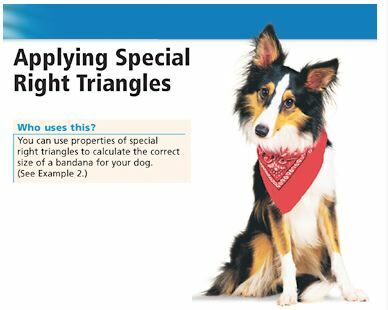 For example, what would you do with the picture of a dog wearing a "triangular" bandana (figure 1)? Certainly NOT what the authors of this textbook example did. But the truth is as Dan pointed out in the session these kinds of contrived examples - unnatural currents, as he calls them – are difficult for students to own as real. By solving the escalator problem (see Dan’s blog) he and his collaborators were doing a far more interesting albeit more challenging problem. The contrived version (figure 2) remains in the textbook still to be conquered or ignored as many of you might consider doing until you realize that not only might this problem be on one of those dreaded standardized tests but it's also a part of the way that Algebra works its magic and is very interesting to folks who like math. And if I want kids to appreciate math don’t we want them to be able to understand how the powerful ideas in Algebra makes solving problems so elegant? So I started looking for a manipulative to use with the Kayak problem. After a quick Google search I found a virtual manipulative*** written in Geogebra. I used the data I collected from this simulation and a spreadsheet to help me solve this in a way that I think would make sense to kids. This is my initial collection of data. 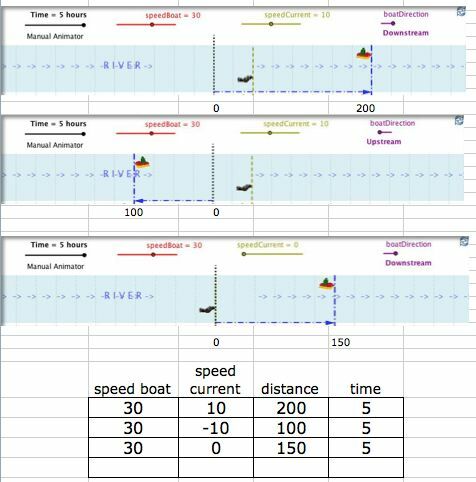 From my chart I see that that sum of the speed of the boat and the current is the same as the distance traveled divided by the time it took. In the kayak problem since we know that distance = rate x time and distance = 12, and time upstream = 3 hours then the average speed of the kayak is 4 mph. Going down stream the kayak takes only 2 hours, so it's traveling 6 mph. The only current stream speeds that are possible for the times to travel both up and down stream in the same time is either 5 or 1. Why? 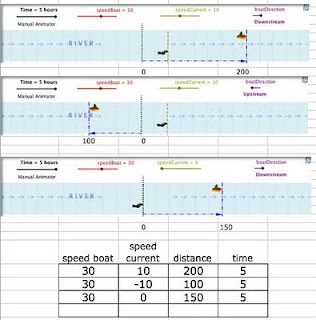 If stream speed is 5, then the kayaker could cover the distance downstream in 2 hours with a boat speed of 1 mph and vice versa – switch the 5 with the 1. 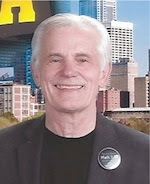 The same works for upstream. This time subtracting the current speed from the kayak speed has to equal 4. And 5 and 1 do that as well. So in review, is this a contrived problem? Yes, indeed. Do we need better ways to teach it. Very definitely. The way to do it is for teachers to put on their creative caps and work with colleagues who can bring something to contribute to the WCYDWT curriculum party! And that’s what Dan is doing at his blog site right now. **Thanks, Dan, for the cool word.